It is the goal of all hash organizations to attract and develop a broad group of experienced hashers. Members of a hash take turns organizing and "setting" hashes for the group to enjoy each outing. Active hashers should plan to host and organize a hash themselves or with others from time to time. The following guidelines are provided to help MASH hares in Seoul plan a successful hash! On! On! 3. to provide an opportunity for relaxed social interaction." 1. While trying to design and execute the perfect MASH hash, remember to relax a little and have some fun!! These guidelines are open for interpretation! 2. The ideal hash site is accessible both by car and public transportation with ample trails and a semi-private "on-after" area. Traffic is a problem so having a hash site that is accessible by a dependable subway-bus(shuttle) connection makes getting hashers to your hash much easier and less stressful for all. 3. Do lots of reconnoiterring around the area you are considering and look for connectable trails (and roads) that can make a fun hashing route. Good scenery is great and highly desirable but it is not a good idea to go up and down all the nearby hills. Think "running" not "climbing". Then do another recce! "Recce" in any language means walking/running lots of trails -- often stopping, turning around and going another way. Plan on 2-3 two-hour recces before you can begin to envision your hash routes. 4. After you have decided on your site, make a map or at least write clear directions for drivers and for using public transportation. Have someone else check your directions and try to time both the driving route (on a Saturday at hash time!) 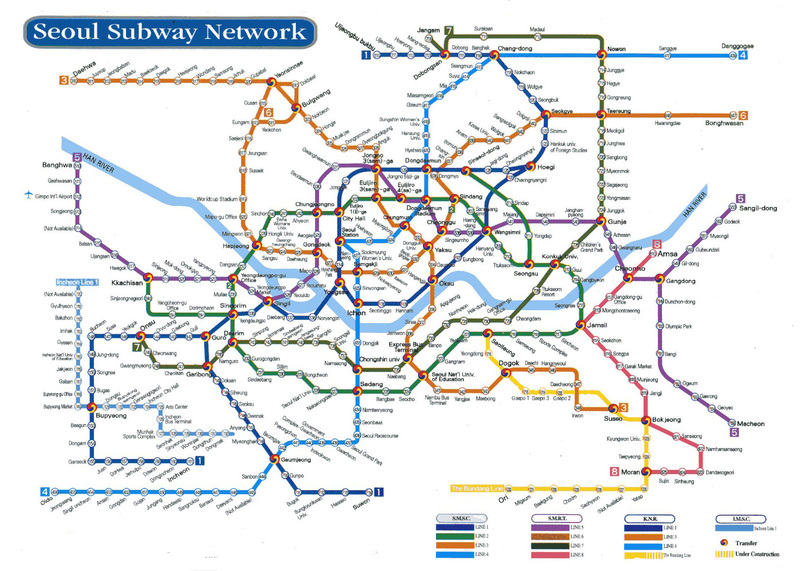 and using the subway from a central point like Seoul Station. Maps are nice but good directions are absolutely critical. Later we will develop a MASH hash site map that will show all of our sites thus making it easier for everyone. 5. Plan a runner's hash route and a separate walker's hash route. Each route should take about an hour to cover. Longer is better than shorter but around 90 minutes should be the limit. It is important that these separate routes not be too close to each other to avoid confusion. The runner's route will require markings and techniques called checks to keep the pack together. See illustration. We recommend you use the following hash marking conventions so everyone can understand your markings. Generally, a MASH hash route will start at point A and return to point A by a different route -- usually some variant of a loop. However, it is also good to vary the direction the route goes so it doesn't become predictable. In any case, the MASH horn will sound the horn occasionally to let everyone know the general direction of the leaders. Mark the walker's route so it can be easily followed or plan to have someone lead the walkers around. In a new area, you might want to do both. 6. It never hurts to have a sweeper for both the walkers and especially the runners to ensure hasher accountability. It's no fun to look for lost hashers in the dark! 7. When to mark your trail is contingent on many factors -- mainly available time to do so. It is usually best to mark your hash routes no earlier than the day before to avoid having it rained away or swept up by some conscientous Korean. It's a good idea to get a note written in Korean explaining why you are putting the markings down (unless you can speak Korean!) so you can show it to people who might otherwise "clean up" as soon as you move down the trail. Most Koreans respect fitness and like to see foreigners enjoying their hills and trails. 8. The "on-after" drinking and socializing is -for some- even more important than doing any running so a good site is very, very important. 9. Food is also highly desirable and reimburseable. It gives you yet another dimension to make your hosting truly memorable. More than a few hashes have been a little short or not-so-well marked only to be saved by great snacks afterwards! All is forgiven after a down-down or two! 10. Hares should plan to stay to the end or coordinate with the committee to police up the area afterwards so MASH doesn't develop a reputation for littering, etc. Another quote from Half A Mind: "...a well-set course will provide both frustration and salvation without active participation of the hares." Generally, the hare and cohare run with the pack but do not offer advice or drop hints, unless absolutely necessary to prevent the hash from dissolving into total chaos! If they have set the hash route properly, hints shouldn't be necessary. These quidelines are provided to assist anyone considering hosting a MASH hash. The committee is quite willing to offer further advice and guidance to ensure the mutual enjoyment of all involved. We are also quite happy to pair up enthusiastic new hashers with more experienced hashers to make future MASH hashes fun for everyone. So... if you have a potential site that you think would make a great hash, let us know and we'll help you make it a brilliant MASH hash. On! On! Each hash route should try to include worthwhile physical features of the surrounding chosen area that will make the course interesting and set it apart from the typical "jog around the block." This can be a muddy or swampy area, a stream crossing, a hill with a view, or other scenic spots such as a waterfall, a flower garden, some ruins, a nudist colony, etc. Hashers have run through shopping malls, cemeteries, horse racetracks, through military maneuvers, etc. Use your own judgment. Some hares will have the walkers and runners starting off on the same trail with walkers splitting off for a shorter route back. Other hares will take the time to organize a completely separate route. While considerable attention is given to ensuring that the walkers have a good route, most hares give first priority to developing the runners' route. Walkers' routes are not available at most other hashes. MASH is a family-oriented group catering to all abilities. The pack is kept together and knows where to run by following trail markings which are set at close enough intervals to keep the momentum going. Usually this means nearly within sight of one another. These marks are usually set with flour or shredded paper on trails and with chalk on roads and sidewalks. Because of the recent anthrax scares, using flour for markings is discouraged if other means will work just as well. As you should already know, whoever is leading the pack should occassionally holler "On! On!" from time to time as they encounter the marks to let everyone know that they are "on" the route. After the pack has run about a quarter of a mile or so (there is much variation on this! ), the need arises to tie up some of the faster runners (known affectionately as "Front Running Bastards" or FRB's) so some of the slower runners can catch up a bit thus keeping the pack together -- at least in theory! It is at this point that the hash technique known as the "check" comes into play. The front runners are confronted (usually at a junction of trails or roads) with a circle or a circle with lines drawn from the circle's center in the different directions that the route might go. See illustration. Only one way is the correct way but all options must be "checked out" to determine which is the real route. This means that the FRB's must start exploring the different options given or sometimes just looking all around until the actual trail is found again. Each possible route may have a mark or two indicating that it is possible but unless there is a third mark, it is not "on". Sometimes there will be no other marks except on the correct trail to make it easier for everyone. Other times it will depend on the hares for each particular hash and the marking standards should be explained at the start of each hash. "Checking out" the possible ways from the "check", a FRB may find a mark and he or she should call out "Checking One!" or "On One!" (indicating to the pack that he or she has found at least one mark on what might be the correct route); a second mark will require the call "Checking Two!" or "On Two! "; and then the fun starts: A third mark would indicate the correct trail and the lucky FRB who found it would scream "On! On!" and continue in the lead -- for the moment. However, it is just as likely that this FRB might find a large "X" indicating that this option was, in fact, a "false trail" and he or she should then return to the check and see how the others are doing on the options they chose to "check out". There are also moments when a FRB will be looking for another mark and others will call to them, "Are you?" which means "Are you ON the route?" If they haven't found a mark or a second or third mark but are in fact looking then they would respond with "Looking". Eventually, someone will find your trail and the pack will continue merrily along its way. All in all, it only takes a few minutes but this time-consuming process allows the slower runners to catch up so that when the correct route is ultimately discovered the pack continues more or less together. A normal hash will have eight or more "checks" and a variety of other techniques including deadend trails and loops. Whatever marking standard you decide to use, it is important to keep the marks to the same count at each check. Don't put down four marks and then decide to make it a false trail. After three marks, the hasher should be "on"! If you make a mark but change your mind, be sure to cover it or wipe it out thoroughly. If you haven't already heard it, the only rule of hashing is that there are no rules so...anything goes when setting false trails. The slower runners are grateful for artful checks and the front runners enjoy trying to outguess the hares as to which way might be the correct path. It is a game of wits between the hare and his or her pack. Actually, there is one rule to hashing: no poofters! It is a good rule to keep it simple: at places (junctions) you want to have a check, make a circle about a meter in diameter in the center of the junction (if you think it will still be there later) or around a tree at the edge of the junction to increase the likelihood that it will still be there when the runners look for it some hours later. The problem is that local Koreans who do not know what the circle or marks represent may clean it up so hares need to keep this possibility in mind as they decide where and how to mark the route. When encountering a check, the FRBs know what to do. From the check, you should mark all "false trails" the same using whatever standard you have decided upon. Many use two marks and then a large "X" no further than 100 meters from the original check to show a false trail. The real route will simply have a third mark instead of an "X" and you will continue to lay marks towards the next "check". As you get more experienced or irreverent, you will want to vary the way you do checks. Live and learn as the saying goes. Take a look at "The Short Version" for a good illustration. On! On! Often the cohare stays in the back of the pack to "sweep", sheparding the slower runners through the route and generally overseeing stragglers. It is his or her responsibility to ensure that everyone gets back and noone is left out on the trail completely lost. It is a good idea for all hares to have cell phones with them in case someone gets injured or lost or whatever. In case you didn't realize it, the MASH horn "sounds" the horn to let everyone know that he is on the correct route. This is the real reason why many people come to any hash: to have a few beers with their friends or to meet some new folks. Hashing generally attracts an interesting multi-national mix of Expats so the on-after can be lots of fun. That is why the location the hare picks is so important. The middle of a village is probably not a good choice. The ideal spot offers temporary refuge for foreigners so we can enjoy drinking and laughing without too many concerns about offending any local cultural sensitives. Having a pee spot is handy as well. Be consistent with your markings! Use circles for "checks." 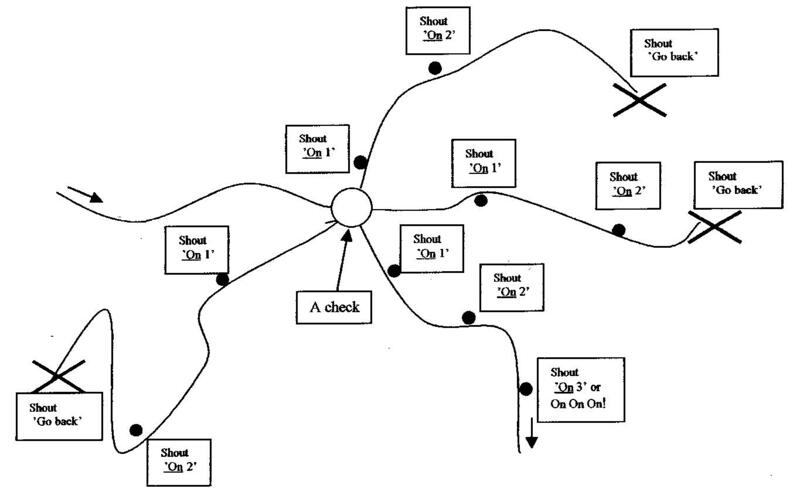 A "check" is used at junctions (or other places) where there may be false trails. See illustration. Use a large cross ("X") instead of a third mark for a false trail. Last of the front running pack marks the correct direction for the following pack at the check marker (the circle!). Keep calling "On On" as you run along following marks indicating that you are "on" the trail laid by the hares. This is especially helpful to those at the back! Hash Horn to sound said horn regularly and clearly to guide the pack in the correct direction. Do NOT shout "On On" at the first or second marker following a check --it may be a possible false trail!-- otherwise the RA will kill you (slowly) if he runs along a false trail unnecessarily. Instead, call "On 1" or "Checking 1" for the first mark, "On 2" or "Checking 2" for the second mark, and "On! On!" if you find a third mark!. If you find a cross indicating a false trail, then turn around and call "On Back"